The 22 Prime welcomes you with such a fine and intimate mood, with low lights that offer a unique view of the city from the 22nd floor while boosting an ambience that is calm and elegant - one where you can offer your focus to savoring the dishes, get a glass of booze and appreciate a delightful conversation. 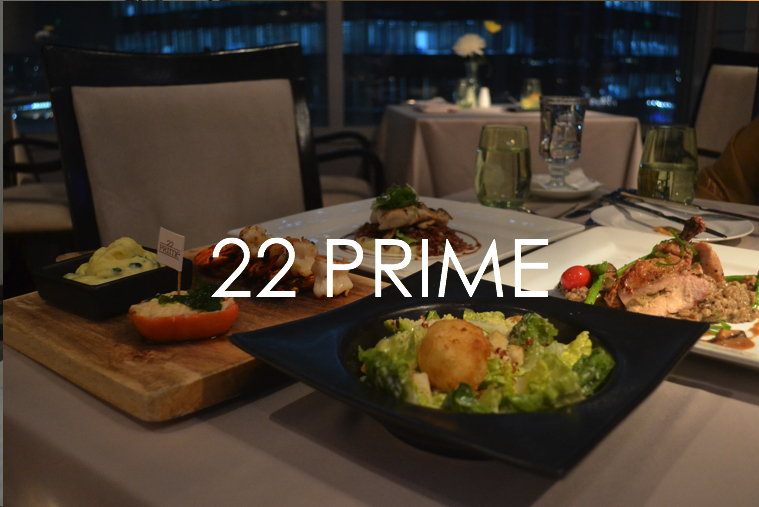 The 22 Prime has a wide variety of dishes to offer, ranging from light and healthy pasta to the finest steak, regardless of your appetite there's always something waiting for you at the menu. But this time, my folks and I wanted something between light and heavy, hence, we opted for some poultry and seafood. For starters, a classic Prime Ceasar Salad with Bacon and Six Minutes Egg and a basket of freshly baked pastries were our initial feast. Jumbo Prawns fresh from the grill started the main course, the fine seasoning complimented the prawn meat without overpowering the strong taste of the prawns, surprisingly, a whipped spinach gratin was a perfect pair because of its lightness and texture. The Miso glazed Black Cod was an interesting dish infusing Miso and Cod in a single plate. The dish is served with cilantro infused red rice and a cauliflower puree to balance the salty effect of the soy glaze sauce. Shiitake and Bok Choy are on the side for a fuller taste. The Chicken Airline as the Chef calls it was something bizarre to me, but for good reasons. Foie gras was stuffed inside the Chicken on top of a bed of barely risotto which to me was a smart way to bring in both poultry dishes in one plate. Added with some asparagus and a mushroom emulsion, it is bon apetit indeed! A perfect way to end such a hearty dinner? A scoop of New Zealand's White Chocolate Raspberry ice cream! 22 Prime with its tranquil ambiance and it's amazing menu has captured the heart of my folk's discriminating taste buds and has won my vote to be among Manila's finest restaurants. The next time I will think of dining with special individuals or just a time off for myself, it looks like I now know where to go.